From Degree Checker: “Re: Hal Wolf. WTF on his undergrad degrees and no advanced ones?” I’m not quite sure how Hal’s undergrad-only degrees in business and textile management became the perfect qualification for running the sprawling HIMSS (although I bet he wears really nice suits), but quite a few people in the industry show little evidence of academic achievement or curiosity. However, my dichotomy is this: while I sometimes share the urge to belittle those whose educational accomplishments seem inferior to my own, I appreciate those who lacked the resources or connections to attend big-name schools (or to graduate college at all) yet made their mark purely on their ability and/or ambition. My classroom knowledge has often proved laughably simplistic as I mounted a feeble argument with someone who toils in the trenches every day. I remember that despite my freshly minted MBA, I struggled with the practical impact of depreciation and PTO balances on our health system IT budget until someone who didn’t have a degree provided stories that helped me keep it straight. Therefore, I will save my wrath for those who lack both education and work achievement, holding firm that Twitter-professed enthusiasm offsets neither. From Overhead Opener: “Re: this article pitching a specific EHR vendor’s app. Looks like pure shill work.” I agree. I won’t mention specifics since what I’m about to say is unkind. The author is a notoriously self-promoting gasbag (I edited out the other kind of bag that I originally wrote) and the site isn’t exactly known for the purity of its journalistic endeavors. The author’s LinkedIn lists no degrees and no work experience outside of marketing, which is exactly what this crap piece smacks of despite being labeled as some sort of thought leadership. All of the author’s recent articles for that site pitch the products of specific companies under the guise of identifying big-picture trends. From Green Around the Gills: “Re: Greenway’s DoJ settlement. There are a lot of extremely vindicated former (and current) Greenway / Vitera employees out there this week. Too bad Tee Green just got himself named chairman by Streamline Health. There really isn’t a lot of justice in the world.” I’ve learned from experience that those people at the top tend to stay there. My takeaway: when the captain of the ship sprints for the lifeboats, the rowers had best be considering their escape route, which probably doesn’t include the typical C-level exits of moving to another executive role, taking an investment firm job, or sitting profitably on company boards. Those aren’t rower benefits, but perhaps provide incentive to seek situations that are less dependent on the whimsy of those who are, like everybody else, mostly interested in their own outcomes. Since I’m complaining about misleading clickbait posing as journalism, here’s my full disclosure: despite my headline, I am “from HIMSS” only mentally, not yet physically (that happens Monday at the last possible minute). This is just my pre-HIMSS19 warm-up stretch before the real exercise begins. I criticize HIMSS a lot (because they give me ample reason), but let me be clear – they are unbelievably good at running conferences. Their slips won’t be showing this week. Everything will seem to unfold effortlessly, every microscopic detail will form one pixel of the big picture, and you will leave at the end of the week having seen a polished show in which the props, backstage workers, and a year of planning stayed out of the spotlight. Groups are often lured into starting their own conferences because HIMSS and others make it look deceptively easy to draw a satisfied crowd in the absence of a large staff or budget, but it doesn’t work like that. 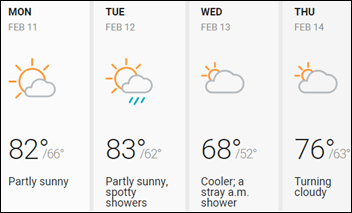 This week’s Orlando weather is looking good, other than prediction of a slightly bleaker Wednesday that exhibitors will love because it will keep attendees inside. Many attendees – including Dr. Jayne – aren’t so lucky with their weather at home, as folks are having their flights to Orlando delayed or cancelled. Text me interesting news, rumors, and photos during the conference. It’s a burner, so I’ll likely ignore voice calls and block the inevitable PR spammers. I’ll just be cruising the exhibit hall and convention center hallways looking for examples to share of both good and bad behavior. Thanks to Dimensional Insight, which celebrated its “Best in KLAS 2019” for business intelligence and analytics by increasing its level of HIStalk sponsorship. Speaking of that, Lorre is offering a deal to companies that want to sign up as sponsors or upgrade their sponsorship, a reward you get only for having the perseverance and ingenuity to find our tiny, poorly positioned booth buried in the exhibit hall alleys (hint: it’s near the place where guys come out checking their zippers – no outside jokes allowed, please). Buffalo-based Catholic Health will implement Epic. I think they’ve been on Cerner Soarian for many years. Also choosing Epic – Saudi Arabia’s King Fahad Medical City. Cerner is usually stronger in that part of the world, but Epic’s go-live at Johns Hopkins Aramco Healthcare a year ago may have established a figurative beachhead. I’m not too bothered by non-experts running underfoot throughout the exhibit hall snapping selfies and acting important, but charging vendors for in-booth appearances while riding the HIMSS social media ambassador coattails seems inappropriate. However, HIMSS itself rakes in a lot of vendor cash for providing exposure and access in blurring the ethical line, so at least it isn’t being hypocritical in insisting that pay-for-play be ended or even clearly noted. I should run a poll of how many readers have been “influenced” by each “influencer,” although I expect they would implore their Twitter followers to stuff the ballot box to validate their self-imagined importance. Buzz suggests that ONC may announce its long-delayed information blocking rules this week. Kenosha Medical Center (WI) will replace teleradiology from REAL Radiology To Envision Physician Services in 2019. Central Peninsula General Hospital (AK) moved from NightShift Radiology to REAL Radiology on February 1. Island Hospital (WA) replaced Nightshift Radiology with REAL Radiology on February 1.
Business Insider ponders the $1.8 billion paper valuation of Medicare Advantage insurer Devoted Health, started up by Ed and Todd Park (formerly of Athenahealth) even with zero customers or revenue so far. That must be one fantastic slide deck. More birth tourism news: a couple from China who paid a company to get them into the US for their baby’s delivery hightails afterward back to China, leaving their hospital bill unpaid and leaving their baby still in NICU because it was born with birth defects. China’s one-baby policy was recently expanded to two and may be eliminated entirely as the country faces economic stagnation, which should reduce some of the barbaric health practices that the law caused. Re: The birth tourism piece-The link you provided is to a Chinese-language website. Do you read Chinese? Another clue to the eternal mystery of Mr. H’s identity??? I wish I could, but I actually can read only the English in Chrome’s “Translate this page” button. Amused by the observation on Hal Wolf’s pedigree, and the insinuation that it is somehow an issue. When I look at someone’s career in retrospect, correlation I see between a relevant degree or advance degree and what they accomplished and contributed is……. Pretty much zero. Amen to that. My career path: dropped out of college, worked as a line cook for a few years, worked in the warehouse of a computer repair store, started repairing computers at said store, then worked for tech support at Apple then EDS, then worked my way into managing data center infrastructure at EDS, then worked through various architecture and consulting roles to end up currently making well into six figures as a global systems engineer for one of the big hardware vendors (and now on the way to HIMSS to be male booth babe).